Preparing Amazing Soup on the campfire! Let’s be honest. A girl’s gotta eat. And let’s be honest. You want to eat GOOD, YUMMY food, and lots of it, especially after a long day of driving, or hiking (interest in hiking? 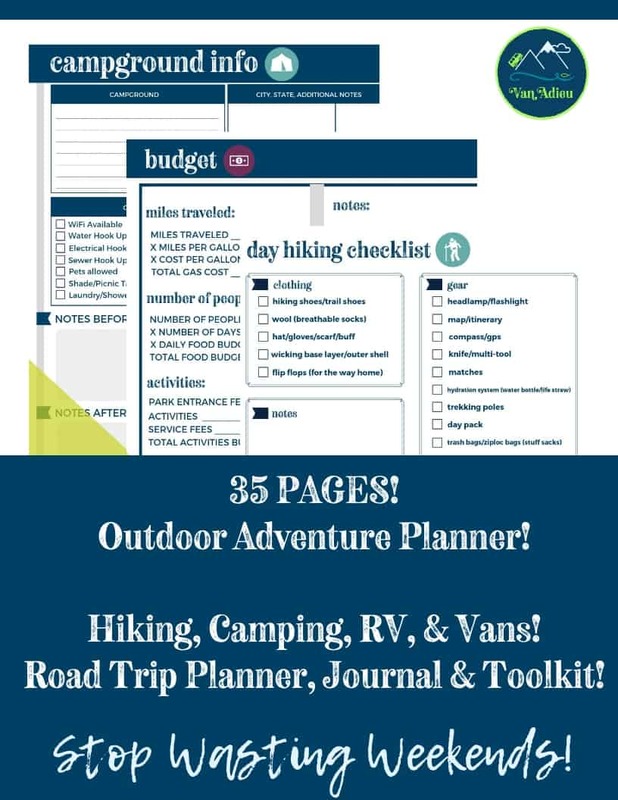 See my detailed hiking directions and maps here! 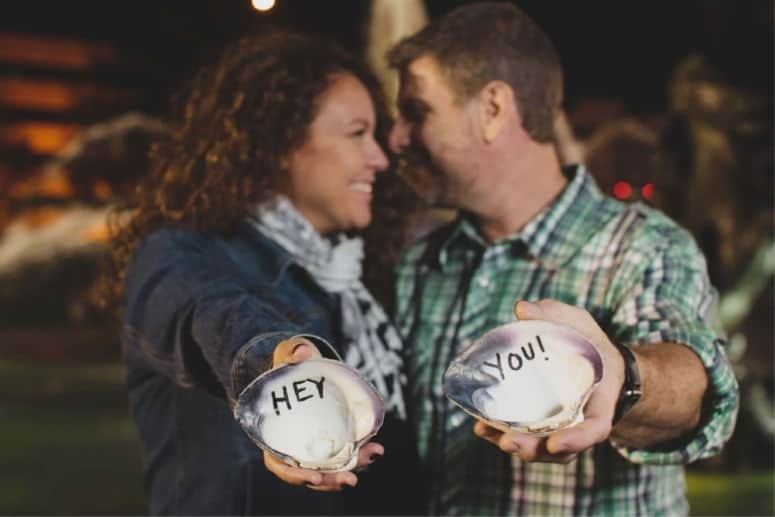 ), or frankly really anytime – because who doesn’t like yummy food? 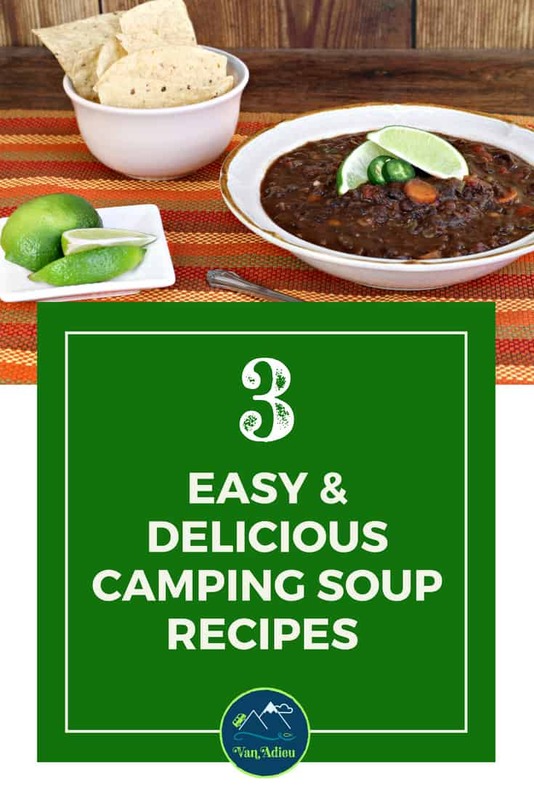 And let’s be even more honest – you want easy camping meals, and you want amazing camping recipes! 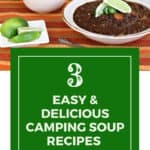 Full disclosure – these camping soup recipes are not vegan, vegetarian, on the keto diet, or any other diet. However, they are full of good non-processed food and real yummy food. Did I mention they are yummy? 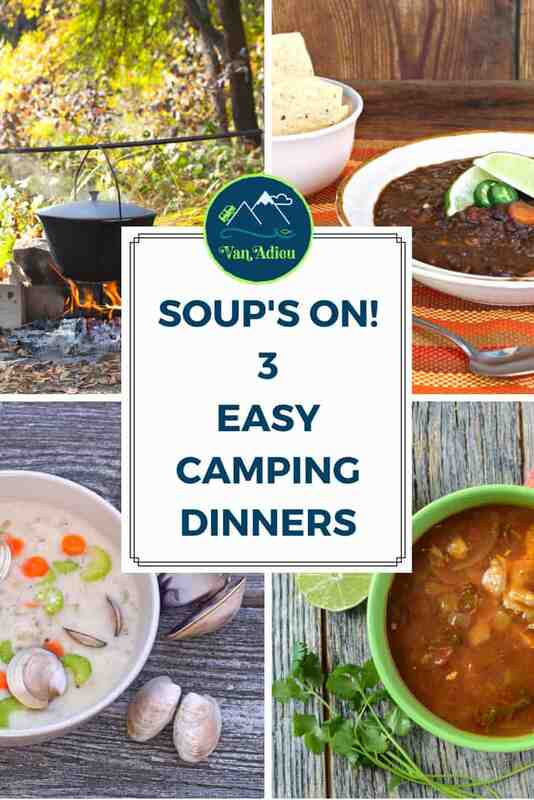 You may be camp cooking for a crowd or a party of two, but these camping soup bowls of deliciousness will keep you warm and filled up with awesome goodness! 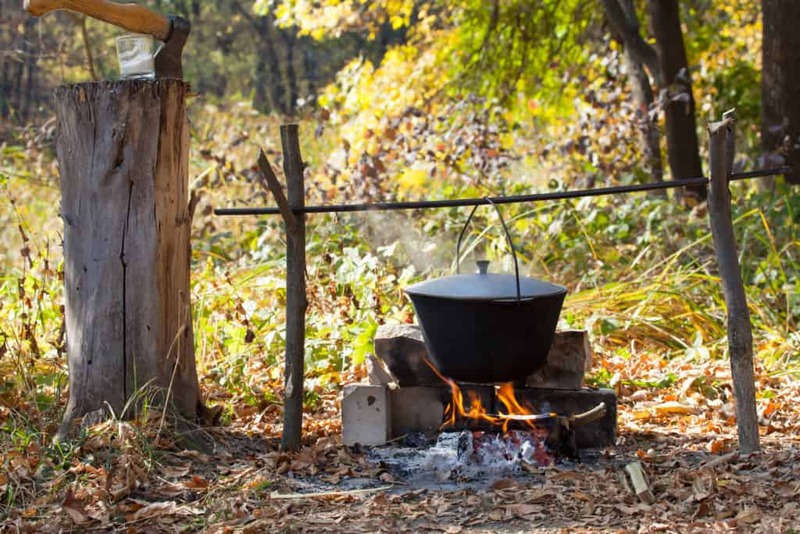 During chilly nights, these camping meals are the BEST and easiest to make. If you are camping, then maybe chop some of these veggies up in a ziploc bag ahead of time, so there won’t be any prep work, and you can just gaze at the stars as your dinner practically cooks itself. FREE FARMERS MARKET SHOPPING LIST! Subscribe and also get INSTANT FREE access to our resource library, the Van Adieu Vault, full of even more free goodies! Before I even get to the recipes, I want to say that I love LOVE love Bear Creek pre-packaged mixes. Yes, they are pre-packaged and are not all natural (which totally goes against what I just said above) but in a pinch – these guys are delicious, and a great way to start a soup and throw in whatever else you have to give it a boost (think chicken, potatoes, etc.) You can find the yummy tortilla, potato, and minestrone ones! These bags make eight servings, and you just need hot water. Coming in at around $6.00 or less, it is a great back up food to have on hand. In fact, do yourself a favor, and just get the soup variety pack and be done with it! You’ll be able to use these in a pinch at home as well when you have to phone it in for dinner. (Trust me, I know from experience)! This is a great starter set that has almost everything you need! This 17 piece set gets great reviews! (And its really inexpensive!!!!) There is an excellent review here of camping cookware! 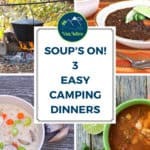 Now, if you want something more homemade and less processed (and more delicious), try out the following camping meals, and warm yourself on those chilly days and nights! 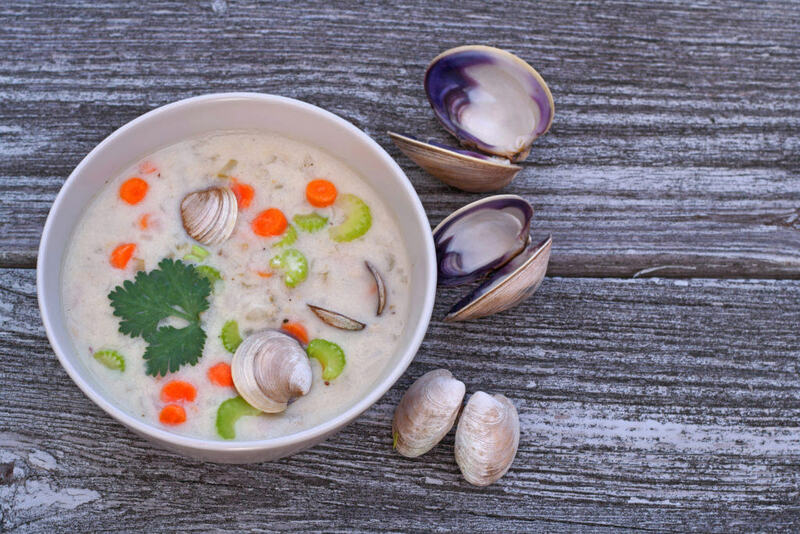 Delicious bowl of clam chowder soup! 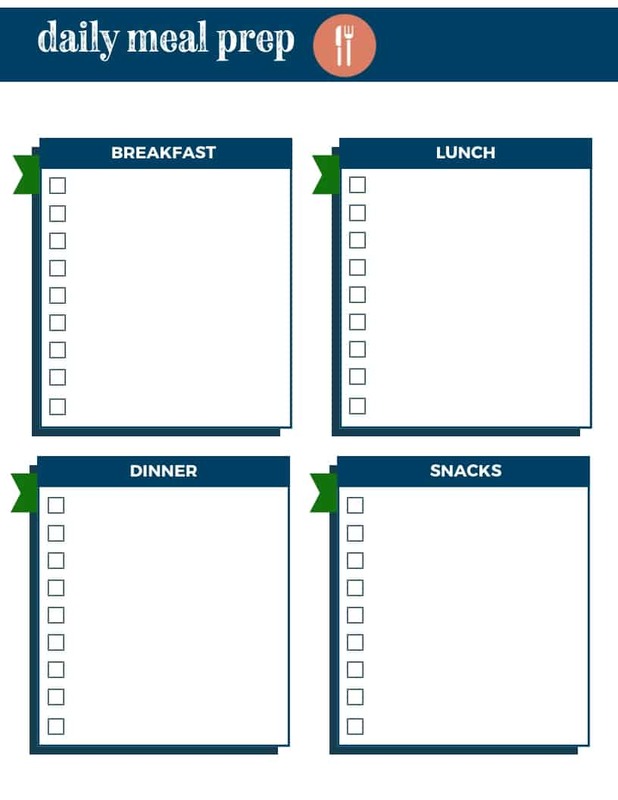 This FREE Day Daily Meal Prep Sheet will help you make sure you have everything you need for any camping or family trip! 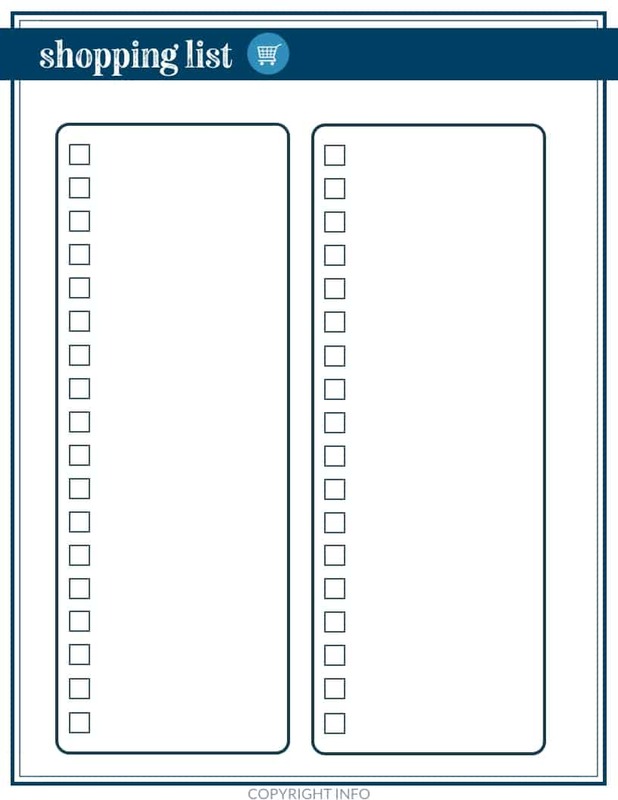 PLUS - You get complete access to the entire resource library called the Van Adieu Vault with tons of freebies and goodies! Directions: Get your cast iron skillet and melt that butter, and then throw the onions on until they are translucent. Add the flour to make a paste, and then slowly (slowly!!!) add the milk. Then add the potato flakes and clams. Stir it up for about 15 minutes. Devour instantly! Note: YOU CAN USE REGULAR POTATOES HERE!!! If you have them, use them! Or carrots or celery! Anything goes! 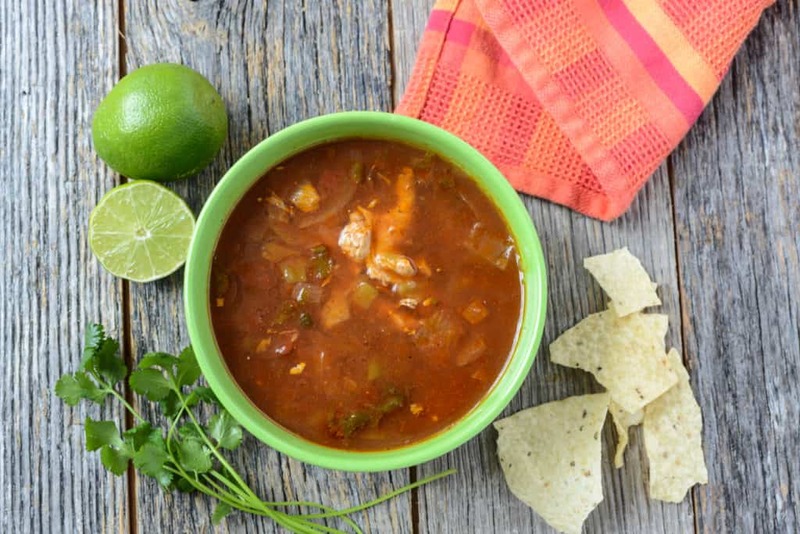 Tortilla Soup with Chips and fresh limes! Directions: Throw first five in pot and saute in the Olive Oil until the onion is translucent. Add the water, lime juice, bullion cubes, corn and tomatoes and then boil it up! Then take it down to a simmer for about 10 minutes and then add your chicken for about 6 minutes. Throw those green onions in, and add to tortilla chips and enjoy! You can always throw on some sour cream or cheese because who doesnt love sour cream and cheese? 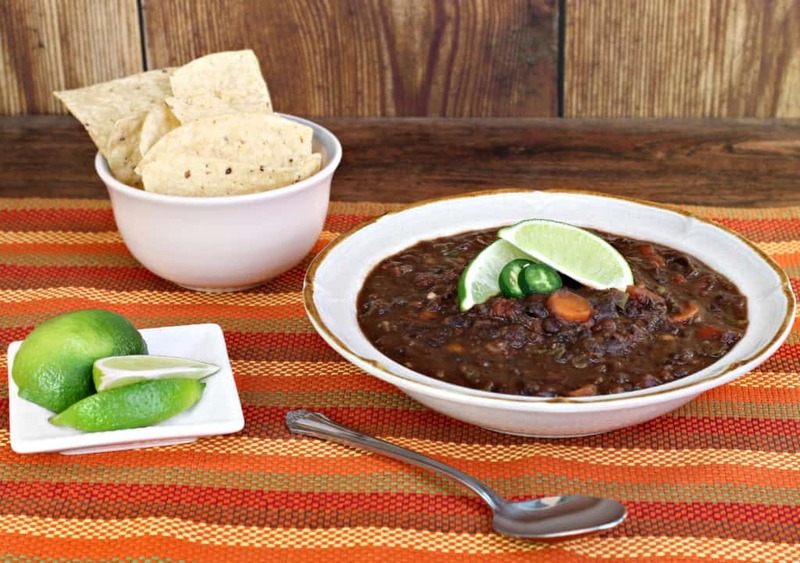 A bowl of black bean soup garnished with jalepeno and fresh lime. Serves only 2 – so double this up if you want more!!! Directions: Drink rum. Just kidding (well, not really but bring extra so you can). Cook the onion, celery, parsley, thyme, and bay leaf in butter on low for about 10 minutes. 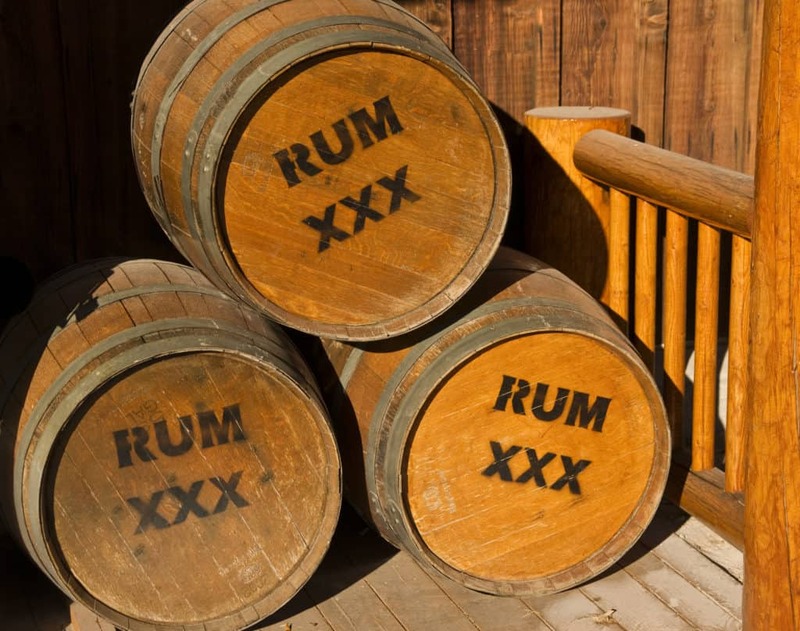 Drink rum. Add bouillon, water, beans, and you guessed it – add the rum (if there is any left). Boil it up! Drink rum. Then reduce to a summer until the beans are tender. Add more water as necessary to keep those bean babies covered! Drink rum. Discard the bay leaf because they are gross to eat, and stir in some lime juice, and salt and pepper, and then – you guessed it – drink rum. 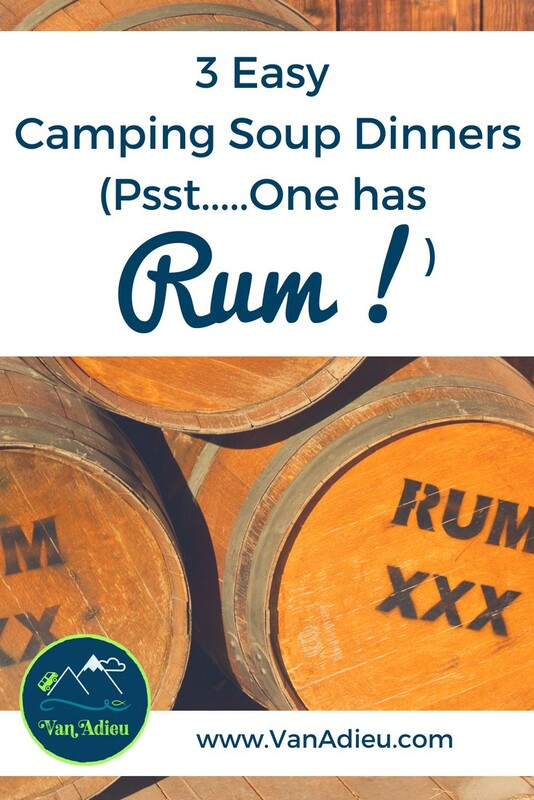 Which camping meal recipe ended up being your favorite? Did you make any changes, or add anything that would make these even more yummy? 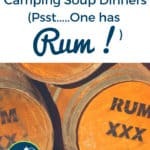 Do you have any tried and true camping soup ideas that you’ve used? 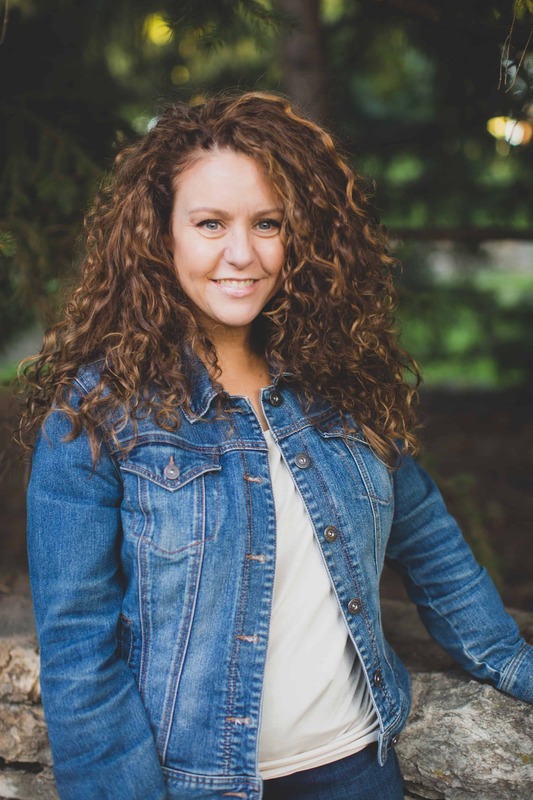 I’d love to hear from you, so please leave a comment! I’ll just be over here drinking rum.